"Three women take on murder, secrets, and supernatural happenings in this charming collection of paranormal mysteries!" A grieving woman makes an emotional connection with a ghost, who leads her to a killer in this gripping psychological thriller. Samantha Torres seems to have everything. As a beautiful lifestyle blogger, her life is enviable from the outside. But she carries a terrible weight, and she has come to Owl Bend, Colorado to forget her painful past. She meets a handsome man in the woods and thinks her luck is changing. When he suddenly dies under mysterious circumstances, Samantha is drawn into the man's past. Date with a Ghost is a riveting psychological thriller / supernatural suspense mystery that will have you glued to the pages and gasping at the twist ending! But the ghost who followed Katie to the desert isn't content with sampling the spicy cuisine and painting the local landscape. This restless spirit is only interested in justice. Katie is finally breaking out of her quiet shell and learning how to paint with abandon when one of the other guests turns up dead. In the wake of the tragedy, Katie surprises herself by finding comfort in a fellow artist's arms. But as new evidence surfaces and suspicion broadens, Katie doesn't know who to trust. And now the vengeful ghost she brought with her is demanding to be heard. GET ALL THREE NOVELS IN THIS TERRIFIC SERIES BUNDLE! 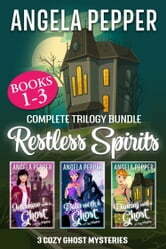 Three of author Angela Pepper's ghost stories are bundled here and with (or without) Marie Hoffman's deft narration you will enjoy many happy hours. ---- Interview with a Ghost in Arizona--Piper and the Lion Imagine yourself invited to visit your absolutely favorite author. When you knock on the door--it opens. But there are no lights on. Whassup, you are asking yourself as you stand in the dark hallway. And then, suddenly, someone rushes past you and shoves you down. And then? And then? A delightful whodunnit with a number of surprising twists even as the suspects are all gathered together (traditional!) . . . in an airplane (not so usual) . . . for the final denouement. All of this is delightfully performed by narrator Marie Hoffman who perfectly pipes Piper and covers a variety of other voices with panache. ---- Date with a Ghost in Colorado--Love Beyond the Grave My previous experience with Ms Pepper's books has been with light and funny tales (murder notwithstanding). This one caught me by surprise as there is a more serious presentation--although still plenty of humor. Marie Hoffman does a terrific job voicing the various characters as she spins the story along, pulling one ever deeper into Samantha's mind and the events around her. Very enjoyable! ---- Dancing with a Ghost--Artful Dodging Katie is haunted by her missing roommate. Or IS she her missing roommate? Author Angela Pepper's devious plots and wry humor are in evidence, but even at the end Katie herself remains a mystery despite solving the . . . mystery. Nicely narrated by Marie Hoffman.